Luxurious gated 2500 sq ft 3BR, 3BA condo in quiet, upscale Amapas on the hill above the south end of town (Old Town). Gorgeous sunset views of Banderas Bay and old town Vallarta. See the cruise ships come and go. This unit occupies the entire 5th floor and has a full length covered balcony overlooking old town Vallarta and Banderas Bay, with access through sliding glass doors from the master bedroom, living room and formal dining room. Great for entertaining and relaxing on the balcony. Living room has new 50" LED flat screen Smart TV with Netflix and US and Canadian satellite programming, and a CD/DVD/stereo radio. MP3 input for your iPod. More views from the living room. Formal dining room can seat 6-8 for dinner. Ask about having an authentic Mexican dinner cooked and served for you in the comfort of the formal dining room. Enjoy margaritas before dinner on the balcony right outside the dining and living rooms. Very large fully stocked kitchen with island and view of town and Banderas Bay. Breakfast bar for in unit breakfast, but take your morning coffee to the balcony and enjoy the view. Two large master bedrooms w/full bath, and third BR/study. First Master BR has 32' LED TV with US and Canadian satelite service. Third full bath off dining room. Plenty of comfort and room to rest after a full day at the beach or shopping, dining out and whatever. I love peace and quiet...and the ability to take a short walk into Old Town for Happy Hour and dinner. Been coming for over 25 years and fell in love with this town. We now spend a lot of time here since I retired. The north facing view of town gets very little direct sun so it is very comfortable sitting on the balcony all day. Master bedroom is situated so you go to sleep and wake up to the view of the bay. Peaceful and quiet. Great view of Banderas Bay, and easy walk to lots of restaurants and bars in Old Town and Los Muertos beach. 3rd full bath off formal dining room. Banderas Bay, Old Town, and Guadalupe Cathedral...fireworks over the beach every night. Mini splits w/remote control in each bedroom and in living room/kitchen/dining room area. Parking available at street level entrance on 7th floor and outside lower gate below pool. Brand new stainless side by side with purified water and ice dispenser in door. Condo has its own water filtration system for drinking water at the sink and in the fridge door, plus the building (all 9 units) has its own water purification system - double protection. View of Old Town, Guadalupe Cathedral and Banderas Bay from DR table. Living room - new in Oct 2014, 50 inch digital Smart TV, internet connected for watching Netflix(your account sign in required) and YouTube. MBR1 - LED flat panel digital TV. American/Canadian satellite programming. Brand new (Oct 2014) 50' flat screen digital TV in living room, and large new LED flat panel TV in Master BR. DVD/CD player and satellite TV music channels. Small library provided. DVD player plays all geographic areas world-wide. Bring some movies to watch. Netflix accessible if you have your own Netflix account, just sign in with your password. Entertain on the spacious covered balcony overlooking the pool and palapa with a stunning view of the town and Banderas Bay...fireworks every night over the bay. Entertain by the pool and under the palapa with a view of the town and Banderas Bay...fireworks every night from the pirate ship over the bay in front of the Cathedral on Los Muertos Beach. In-unit laundry room with washer/dryer; 2 large MBRs with queen beds and full baths; 1 BR/study with full size bed and separate full bath; formal dining room with view; full length balcony off MBR, Living Room and Dining Room with incredible view of town and Banderas Bay. Beautiful condo and weather was perfect. Really enjoyed our stay. Only 2 things were disappointing, there was no sun near the pool, and neighbours across from the condo could have been more respectful and closed there curtains, but l realize you have know control over that. Thank you again for a beautiful stay. 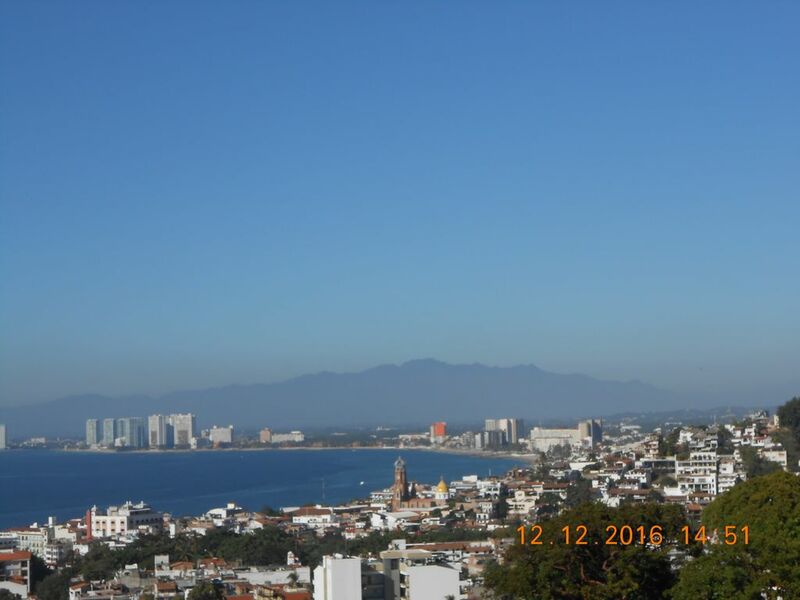 A great view of t city and Banderas bay for new years eve! Lovely spacious condo. Glad you enjoyed your stay. New Year’s Eve is quite a show with many, many hotels and resorts putting on a great fireworks show resulting in fireworks all around the bay for 30-45 minutes. Our balcony is a great place to watch the show. Hope you were able to enjoy it. Great location. Kitchen was well stocked with utensils. Pool area was great and patio views were million dollar. Glad you enjoyed it. We always are sad when our month long stays come to an end. Never long enough!! Clean, spacious and bright, in a gated condo complex this unit is just a short walk down to town. We stayed in this unit for the first time from mid February to mid March 2016. We were looking for something with a Mexican feel that would be close to the fun of Old Town but far enough away to be quiet and relaxing. This unit delivered on all accounts. It is comfortably furnished with lovely Mexican touches in decor. The location was a 10 minute walk down to the Malecon and beach and an inexpensive 50.00 peso taxi ride back up. The walk back up is challenging and was done every day by our adult children who loved the exercise and challenge. I was experiencing knee issues and found the walk down no problem and even succeeded with the climb up a few times. There is nothing like a rewarding dip in the pool after the climb up. It was a great way to keep active. The views are stunning and we couldn't believe our fortune every morning when opening our eyes to see the vista provided. We spent all our waking time in the unit on the terrace which is spacious and comfortably furnished. We prepared many meals in the well stocked kitchen and truly appreciated the supply of dry goods and spices left in the unit. It helped to reduce food costs not to have to completely set up those types of supplies for cooking. The only draw back with the building and unit is the lack of sun. Upon arrival in mid-Feb the pool was completely shaded and as the time progressed, by the middle of March, the pool was in more sun. The best time of day was mornings for sunbathing at the pool. The terrace at the unit was always shaded. This may be an issue for sun worshippers, however we preferred a shade terrace as it was more comfortable in the heat of the day. We found the pool temperature to be quite warm and was very comfortable to be in without the direct sun. Overall the limited sunlight was not a negative for us but might be a disappointment for some. We enjoyed the various birds and parrots which live and play in the green space across from the unit. The managers and owner were always available by phone and email and very responsive. Overall we found it to be a great location in PV and really enjoyed the spaciousness of the unit itself. We did not hesitate to book our return for 2017. Thank my wife for the old Mexican decorations. And we love the balcony with the north facing view and the shade provided by the wall of the building next door. Very comfortable on the balcony all day long. We're glad you enjoyed your stay. Thanks for the nice review. The owner was very easy to work with. This condo has amazing views. There was nothing lacking in the condo. We did have a minor issue with the hot water heater and water pressure initially. Luckily one of the people in our group is a handyman, and he was able to take care of the issue. The condo is very comfortable, but could use an update. If you do not want to rely on your own car or taxi service, bring comfortable shoes for the steep hike to and from. This could be a challenge for small children or the elderly. But otherwise, we had a wonderful time here. Water heater issue - I had turned it off when we left 2 weeks before. According to the renter, it had not been lit and turned on upon their arrival, as I had requested just before they arrived. Sorry for the inconvenience. Payments through PayPal costs an additional 3%. Non-US bank credit cards cost an additional 1%. Payments by check or wire incur no additional fee. Summer (June thru Sept) electricity surcharge - we cover up to 600 pesos per month, with no carry-over of unused from prior month.